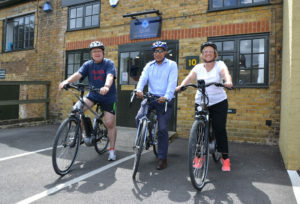 They may work for the automotive industry, but Kent-based automotive business consultancy, Qube, has recently signed up to the government-backed Cycle to Work scheme, with three members of the team already enjoying a healthier and zero-carbon commute to work on new electric bikes. Pictured above, directors Matt Seymour (left) and Elizabeth Walker (right) wanted to encourage healthier living and a greener commute for their staff, and Mobinder Nerwal (middle) was already a keen cyclist. The Cycle to Work scheme was first introduced by the government in 1999, and enables employees to spend up to £1,000 on bikes and equipment tax free, making potential savings of between 32% and 42% depending on their personal tax bracket. Employers pay for the equipment up-front, and then deduct payments from an employee’s salary in instalments, and make National Insurance savings of up to 13.8% through the scheme. Qube has its headquarters in Maidstone Kent, which it has recently extended, and provides business systems and reporting, data management, and consultancy services to automotive companies in the UK and mainland Europe, including Nissan, Lexus and Toyota. The company provides quality data intelligence, tailored to individual requirements, to give decision-makers the insight needed to improve revenue and vehicle retention, particularly across their dealer networks.